Las Islas Canarias, Spanish islands off the tip of Morocco, are a dream destination for us food-lovers and sun worshippers. Gran Canaria, the third largest of the islands, not only has a wonderful ring to its name but is also named after man’s best friend – the Dog. No wonder I love the place, though I do wish that my puppy had joined me to walk the cliff-top promenade during my stay. Early September is a perfect time to visit the island. The weather is faultless – not too hot, not too chilly and no rain whatsoever. While the islands are known for their windy climate (the island Fuerteventura translates as strong winds), you’ll be thankful for the light breeze along the seafront during the scenic beach-walks; these are perfect for walking off the inevitable food-babies after a stackful of pancakes at breakfast. If you don’t want to risk missing any sunbathing time, the beach and pool are the destinations for you, with just enough clouds to stop you from overheating. I stayed in Meloneras, famous for its distinctive lighthouse and proximity to Playa Del Inglés. I don’t think I’ve ever visited a place where the people were so friendly. Waiters laughed and joked with you, making you feel right at home. The best restaurants of the bunch are El Senador, which has the best tapas in town, Grand’ Italia, whose pizzas are inventive and hugely satisfying (make sure you’re hungry as they’re great value for the size) and finally MezzaLuna, another Italian which specialises in unique pasta dishes. 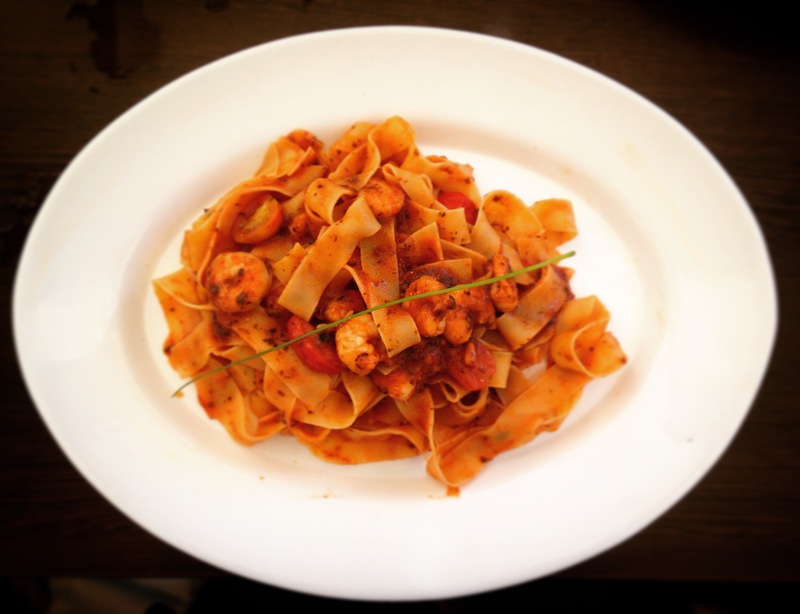 At the latter, I had an unforgettable dish with flavours that I have never tasted combined before – Pappardelle with prawns in a tomato and ginger sauce with a hint of truffle. Canarian cuisine is creative yet straight-forward enough to recreate at home. I always look forward to their papas arrugadas, the Canarian version of patatas bravas (and in my opinion the yummier version). It consists of salt covered baby potatoes, known as wrinkly potatoes, covered in the best sauce ever with the equally awesome name of MOJO. It’s hard to describe the delicious taste of mojo sauce so I’ll let the ingredients do the talking – oil, paprika, garlic, cumin and Spanish red peppers. Green mojo is also featured on menus but is usually associated with fish rather than potatoes. While I usually get the same tapas every time I visit, I was a bit more adventurous this time and chose some new plates. And I’m happy I did because I found a new favourite- Salmon Carpaccio. This one was marinated in a mixture of finely chopped red and green peppers, onion and garlic and presented with slices of chunky fresh bread and a few basil leaves. It was so refreshing and light that I could have eaten platefuls more. Alas I had to share it con mi familia after ranting and raving about it. Unsurprisingly, one of us always went for the seafood paella but this one was unusual because it was squid-ink dyed rice. While it isn’t the most attractive dish, it’s tastier than the traditional, so definitely give it a go. The pièce de resistance, though, was the Salt-baked Sea Bass, which after being taken out of the oven is prepared at your table while the rest of the restaurant watches in awe. Spanish cuisine is easily one of my favourites and I always try and recreate the flavour by adding paprika to my dishes. You might have already guessed after looking at my recipes that I’m a bit obsessed with that spice. If you fancy recreating your own paella, check out my Canarian-inspired recipe here.